The powers of Philippines government officials, are the stuff of legends. It's hard to say where the truth ends and where the lies begin. Once in a while, we get to see the truth in it's naked form. Here, a camera bears silent witness to abuse of power. According to an Inquirer News report, it is a CCTV footage (below) of the Banyan gate of Dasmarinas Village along McKinley Road in Makati City. It has a time signature so we can tell exactly when it started, 2013 11 30 23:39:12 and when it ended at 2013 11 30 23:54:10. And it confirms the rumours that the Junjun Binay and his family do wield superpowers. Our story begins when the 4 SUV convoy of Makati Mayor Junjun Binay and his sister Senator Nancy Binay, arrives at the Banyan gate at 11:39 pm on 30 November 2013. The convoy is waiting for the boom to go up, but it doesn't. So a man steps out to find out why and maybe inform the guard whose convoy this is. The security protocol of the village does not allow vehicles to pass through that gate after 10 pm. All exiting vehicles will have to take the Palm Ave. gate 150 meters away from the Banyan Gate, so the guards stick to their protocol. I understand why this might irk the Mayor a bit. The guards could just do them the courtesy of raising the barrier for a few seconds and it would be over, but the guards didn't, They persisted steadfastly on implement village security regulations. This is likewise understandable and quite commendable under the circumstances, so as government officials the Binay's should have just complied with regulation. It would take very little effort and time to respect the village rules and exit through the other gate, while appreciating that the guards had the discipline to implement these rules without special favor to anyone, not even the Mayor or the Senator. It did take a lot of courage and discipline for the guards to say 'No', given the stature (and temperament as revealed) of the officials involved, It is after all their job to secure the gates. Now here is where it gets interesting. The Mayor would not let it go. His convoy refused to leave until the guards let them through. The video shows that for 15 solid minutes the Mayor and his entourage conducted themselves in a manner that screamed through the silence, 'I have the power and you will bow to my will!' You see a man brandishing a long weapon, displaying it prominently for the guards to see, perhaps in the hope that this would intimidate them into submission. Another man had a pistol which he loaded and cocked also probably for the guards to see. None of that worked. The guards did not lift the barrier. You then see Mayor Binay talking on his cellphone with one hand on his hip. (the classic power pose). You can tell that, this man is indeed the Mayor because at some point you will observe another man who was standing beside him, run frantically back to the car as if something terrible happened that needed his urgent action. That man opens the car door and retrieves an umbrella. He then hastily returns, and from that point on will relentlessly follow the Mayor around with the umbrella. In the meantime about 5 or 6 men are walking around as if patrolling the area. As the footage progresses, three more guards arrive on their motorbike in close succession. They would be surrounded by the Mayor's men, disarmed and made to stand back on the opposite sidewalk. The Mayor was outside the gate under his umbrella pacing anxiously, waiting for something or someone to arrive. Let me just point out that if they had turned around and exited through the other gate when the guards first suggested it, they could have been well on their way and none of this display would have been necessary, but I guess the Mayor had another thing on his mind. All throughout the footage, the guards stayed at their post and maintained their position. Finally the police arrive. It's hard to make out exactly how many they were, but 2 men appeared to be in uniform. The other figures were too dark to make out. One of the policemen raised the barrier, approached some people standing around on the road and talked to them. It was at this point when all the Mayor's men on the road, went back into their vehicles and drove off through the gates. It was over. Or was it? Okay, they had to arrest the guards and detain them for 4 hours in the middle of the night to verify if the permits of their firearms were in order. The police urgently needed to verify firearm permits of these particular guards because they were posing some serious threat to public safety? Do they do this as standard procedure with all the guards or just the ones who don't know who's boss. Anyway everything was all ironed out in the end. The guards were all instructed by their agency to apologise to Mayor Binay and no charges were filed. What? Wait! No! Apologise? For what? Doing their job? No charges were filed for what crime exactly? My guess is Mayor Junjun Binay was not aware that a camera captured this entire exercise and he probably believed after his awesome display of superpowers at the stroke of midnight, that no one would ever dare cross him again. But here's the thing, people are fed up with abusive power tripping public officials who think that their power and position put them above everyone else. They act like the public resources under their stewardship is meant to be dispensed at their every whim, for whatever suits their fancy. I really wonder if all Public Officials, especially Mayor Binay, is aware of Republic Act 6713. (a) Commitment to public interest. — Public officials and employees shall always uphold the public interest over and above personal interest. All government resources and powers of their respective offices must be employed and used efficiently, effectively, honestly and economically, particularly to avoid wastage in public funds and revenues. Okay let's break it down. This is the code of conduct that Mayor Binay is bound to, by virtue of the public office he holds. He is bound to uphold the public interest over and above personal interest. Reviewing the video, the only interest he adamantly upheld was his own. Public interest would have dictated that he comply with the village security regulations, but everything he and his people did was focused on defying that regulation. For what purpose? Was he on any urgent official duty that required him to pass this particular gate in the village? The time and place strongly imply that this was not official business, and his insistence to pass through the gate had no reasonable justification. The initial intention might have been for his convenience, but as time passed, it turned into an arrogant show of who's boss. Compared to all the effort he put into getting the guards to lift the barrier, it would have been far more convenient to simply turn around and use the Park Ave. Gate which was a mere 150 meter away. Instead, he argued bitterly with the guards, he had his men display their weapons, he had his men disarm the guards, and to top it all, he called in the Makati Police, who finally lifted the barrier to let the Mayor through. To use the Makati Police Force for this purpose, and worst of all to have the guards arrested, that was just the most blatant violation of RA 6713. Where is the public interest in all of this? It's not enough to tear the Mayor apart on our social networks. It's about time we make our laws work in our favor. We need to demand that public officials, like this Mayor who brazenly violate the code of conduct, be penalised to the fullest extent. There is no excuse for behaving like that especially in public office. The final point I want to drive home is this. 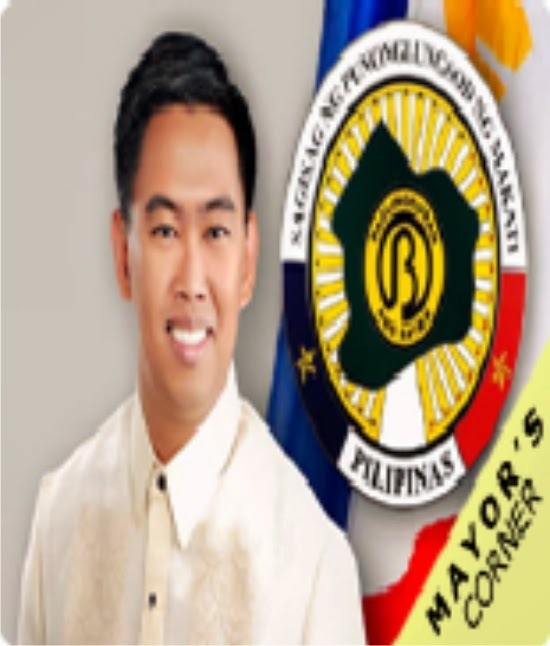 Mayor Binay is an elected official. He is in office because voters put him there. People's votes determines who will control the power of office, whether it be Mayor, Governor or President. The person who is voted will be in charge of public funds, of public resources and of public institutions (like the police and military forces). So it is very, very, very important that the votes go to a competent person with good moral character, who will uphold public interest over and above their own. It's no longer enough to just cast your own vote wisely. If we want to see decent people in office, we must do our part to campaign vigorously for decent people and educate all the voters we have access to. This is the duty of every Filipinos. If we are remiss in that duty, we will keep seeing the likes of Mayor Binay and Vice President Binay in office. Good government starts and ends with the people, so get involved. 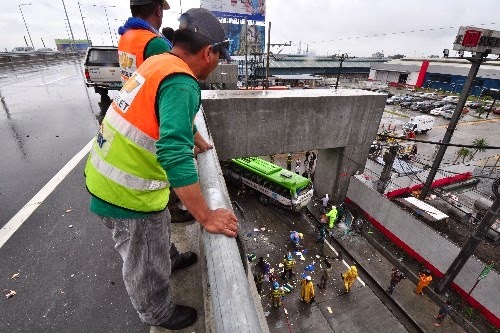 The first time a vehicle flew off the elevated road known as the Skyway along the South Luzon Expressway in Metro Manila, the government and the toll operator should have realised that this road was going to be a looming public hazard. Granting that any road is dangerous where vehicle speeds are on the high side, but put that road 30-40 feet above the ground directly over a busy street and the hazard factor quadruples. To correct the problem, the speed limits were reduced, that was a good measure to implement. Slower vehicles are less likely to lose control and will have a weaker impact if they hit something. Then they went after the reckless drivers, that was a very good measure as well. Reckless driving was a major factor in all the incidences of falling vehicles. So getting reckless drivers off the road will make the road safer. But accidents happen. A momentary lapse of judgement on a slick road is all that's required for a disaster to occur, and when it does, the final safeguard is lacking to avert the worst possible scenario. The fact that a bus or (any type of vehicle for that matter) can fly off the elevated road onto a busy street below is a major problem and nothing at all has been done to address it. The building code for elevated roads must be revised to minimise or eliminate the possibility of vehicles falling off the road. And all non-compliant structures must be corrected as soon as possible because once a vehicle goes off an elevated road, serious injury or death is guaranteed for anyone in that vehicle and anyone else who might happen to be in the path of that crashing vehicle. In all cases where the vehicle flew off the Skyway, no passenger has escaped serious harm. In fact all cases resulted in horrible deaths. To protect the public from this ever-present hazard, all elevated roads must be equipped with railing or fences that will effectively deter vehicles from falling off the road, in the event of a accident. Early morning yesterday (16 Dec 2013), a bus flew off the Skyway in Taguig killing 22 people (including the driver) and injuring 20 others. In this latest incident, that bus which belongs to Don Mariano Transit, Corp, was plying the Novaliches-Pacita route when it happened. This is by far the worst of all the accidents in terms of the number of casualties and injuries. Because of this accident, compounded by several other previous accidents involving this same bus company, the Land Transportation Franchising and Regulatory Board (LTFRB) has suspended their franchise for 30 days grounding the transport company's entire fleet of buses. The company will also be held liable for the deaths of the passengers. CCTV captured footage of the bus speeding along the Skyway, when the accident happened. On 26 July 2011, a Dimple Star Bus also flew off the Skyway and fell on the service road below killing 3 people including the bus driver and wounding 4 others. The conductor who survived, said that the driver had trouble controlling the bus because of a strong wind. It was raining hard at the time and the road was slippery. There was a report that the bus was "slightly speeding". The Dimple Star's franchise was likewise placed under preventive suspension for 30 days. July 2011-A Dimple Star Bus fell 30 feet from the Skyway near Sucat, killing 4 people. The earliest report I could find on vehicles falling off the Skyway happened on 25 January 2007. 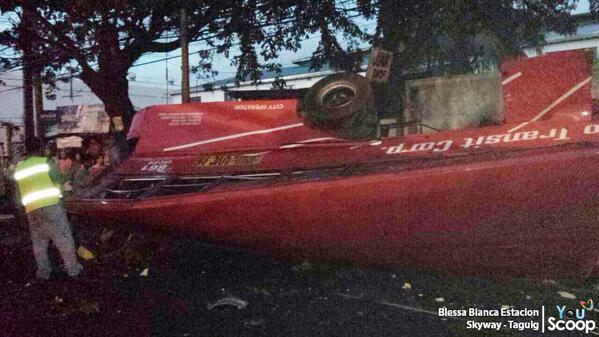 An armoured vehicle fell off the Skyway in Makati. The article briefly quoted a report, but the quoted report was no longer available so there is very little detail about the accident, except that 4 people were killed as a result thereof. January 2007-An armoured vehicle fell from the Skyway in Makati killing 4 people. Although there are steep penalties in place to punish the erring parties, it all happens after the fact and the measure does very little to prevent similar accidents from happening. It does does remove the inherent danger to the commuting public. Speed limits are good only if they are followed. Penalties can punish and remove reckless drivers from the road but only after they have cause harm. If a tired, cash strapped driver, trying to maximise his income, steps a little too hard on the gas pedal on a rainy day, another vehicle may just fly off the road again because nothing will prevent it from falling over. And more people will die. Tragic loss of life in accidents like these will keep happening until elevated roadways are built with the necessary safety features. It is not enough that buses and motorists are made to shoulder the full brunt of this issue. Road builders and operators need to take some of the slack as well, because public safety is at stake. If roads are built without the necessary safety features, the government is just as culpable, because they are allowing road/ toll operators to gamble with people's lives. 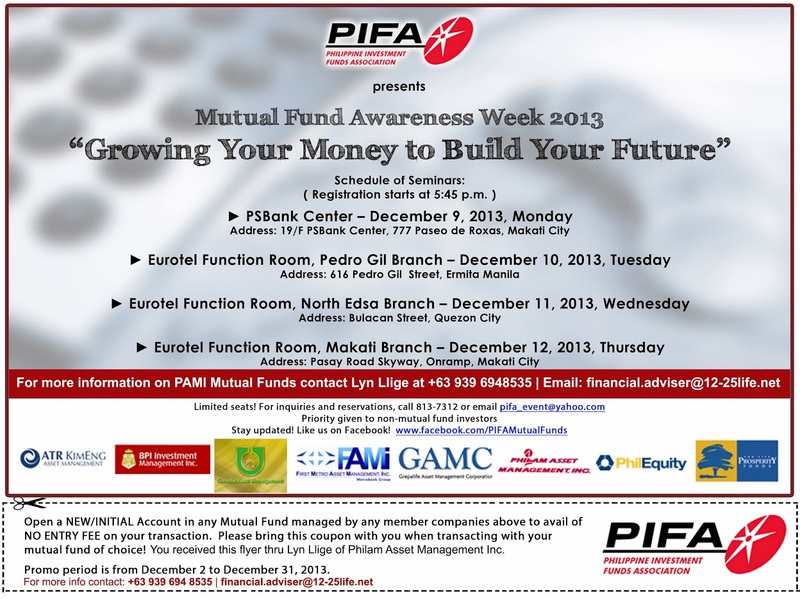 The Philippine Investment Funds Association (FIPA) is celebrating the Mutual Fund Awareness Week 2013 with a seminar on "Growing Your Money to Build Your Future" and a No Entry Fee Promo for all participating member funds all throughout December. "Growing Your Money to Build Your Future"
There will only be limited seats so you will need to make reservations. For inquiries and reservations, call 813-7312 or email [email protected]. Priority will be given to non-mutual fund investors. To stay abreast with the latest updates on Philippine Mutual Funds you may visit their website at www.pifa.com.ph. Promo period will run from December 2 to December 31, 2013. This is a rare opportunity for new investor to start an investment program with no entry fees. Filipinos in general, operate in a consumption driven society. Many of us fail to see the power of saving and investing. There are a few who are avid savers but very few understand the value and power of investing savings long term. Often money is kept in savings accounts in banks, where it is presumed to be "safe". But what most fail to realize is that savings account almost as a rule pay out interest that is below inflation. And although it appears to be safe, the money saved loses its value over time. Investing an increasing portion of your savings regularly over a period of time can actually leverage your saving significantly. You not only preserve the value of your money, in many cases you can even increase it. Many people I have talked to, think investing is extremely technical so very few want to invest. The truth is, investing does not require a lot of high-tech expertise. It really is more a matter of discipline and a basic understanding of investment principles. When a persons commits to a saving/ investment program, he or she will begin to see it as a powerful tool for financial independence and wealth creation. It will take more than just a blog post to present a fuller picture of investment here, That's why I strongly urge you all to do yourself a favor and attend these PIFA seminars. It's free and it will be a great first step to your financial stability. Mutual Funds free you from the burden of having to manage your own investment portfolio, so it's ideal for new investors. And if you still have doubts and questions after that, I will be glad to personally walk you through the bumps and hiccups of your financial journey. We can do it over email, phone, Skype, or even face to face, whichever works best for you. This is my advocacy; to see the Filipinos transform into world class investors. You don't need a lot of money to invest. You just need to make a commitment to do it religiously, regularly. I am Lyn Llige. If you want to know more about me you can view my LinkedIn profile. Let's get connected. I would love to help you out. The sooner you start the better for you, because the real secret to building wealth is not so much earning a lot of money (although that helps, it's never a guarantee). The secret is keeping and investing diligently and starting the habit early. It doesn't matter how small the amount. The power of compounding over time is mind blowing. It's sad that very few Filipinos know this. Don't be one of the clueless financial zombies. Get educated. If you want to discuss the post further you can reach me through my email at [email protected] and we'll take it from there.